Participants, leaders and the support group pictured on the final night of Operation Transformation at Cill Barra. 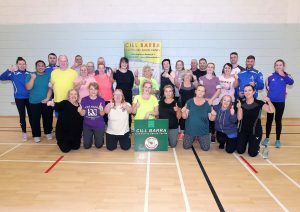 OVER the course of eight weeks, Cill Barra Community Sports Centre took on the Operation Transformation Challenge and achieved a phenomenal total weight loss of 731.5lbs – the equivalent of almost 333 bags of sugar. In early January over 80 participants began their Operation Transformation journey with a programme of exercise and healthy eating spanning two months. Those who signed up were given guidance from mindset expert Shane O’Sullivan of Inspiring Excellence, nutrition expert, local dietician Brendan Cullinane and fitness expert, David Phelan from the Cill Barra Community Sports Centre. The talks from the health panel focused on the importance of making small changes daily to help improve overall health and wellbeing. Leader Pat Scahill has felt the benefits of the programme. “I’m looking and feeling better, my clothes size has gone down, and my belt is gone back a notch.” Caroline Sealy shared her own thoughts on the programme. “Lovely people turned up every week to spur us on. As a result, new friendships were made,” she said.